It's been a while since my last post and this time, I intend to keep this blog updated everyday. Anyway, it's December, winter, and a season for citruses. As you can see, what compose the above plate are citruses, namely: orange, malta, kinno; guava and carrot. These are for two people for breakfast after a small cup of tea. Along with these fruits, my husband and I are munching nuts, too, like almonds, pistachios, walnuts, cashews with raisins, flaxseeds or sunflower seeds. Funny to include it here but I just want to share one of the usual scenarios that my husband encounters during his usual OPD. Most patients come with common cough and cold and when my husband asks whether they eat citruses fruits they would reply outrightly that they DON'T because these fruits give them cough and cold. Then my husband eventually say, "you're avoiding them and yet you still get cough and cold? How can that be?" And they just smiled or scratch their scalp because they couldn't find any fault in that logic. Nature isn't dumb. 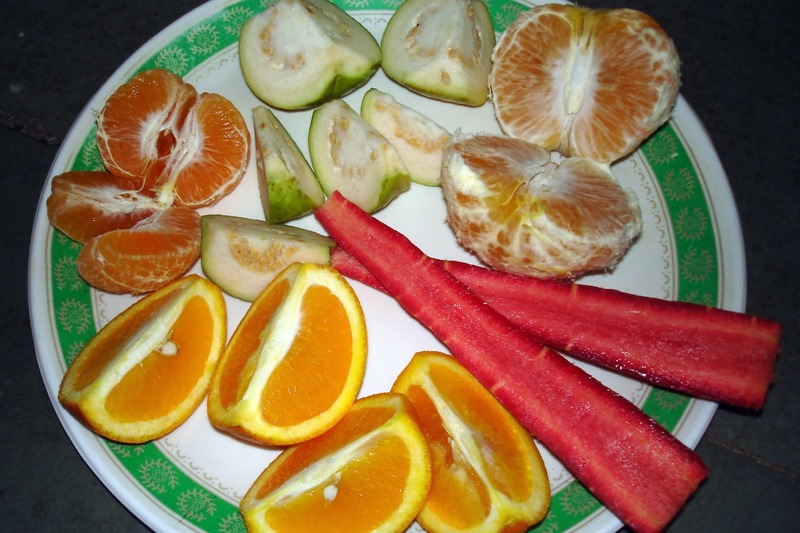 The reason these fruits are available in winter is for us to devour them in plenty to avoid getting cough and cold. Simple as that! When do you want to eat them? In summer? Well, you will miss your chance because obviously, they are not available in summer.